During visit to Jordan, Secretary of State says withdrawal from Syria will not jeopardize efforts to pressure Iran and fight ISIS. The US decision to withdraw troops from Syria will not jeopardize Washington's efforts to counter threats in the region, which come from Iran and Islamic State (ISIS), Secretary of State Mike Pompeo said on Tuesday, according to Reuters. 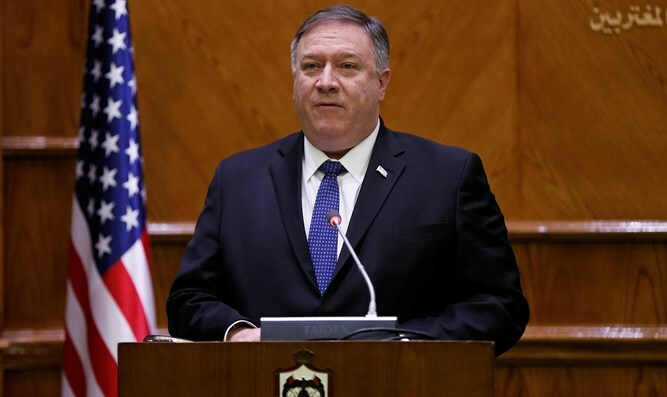 Pompeo was speaking in Jordan, making his first visit to the Middle East since President Donald Trump's abrupt announcement that he will pull the 2,000 US troops from Syria. Pompeo, however, made clear that Washington was not stepping down from its efforts to challenge Iran. American policy makers were "redoubling not only our diplomatic but our commercial efforts to put real pressure on Iran," he said, according to Reuters. The Secretary of State’s Middle East trip, which was announced last Friday, also includes stops in Egypt, Bahrain, the United Arab Emirates, Qatar, Saudi Arabia, Oman and Kuwait. The trip is supposed to run through January 15. On Monday, Turkish President Recep Tayyip Erdogan warned that the US withdrawal from Syria must be planned carefully and with the right partners. In an op-ed for The New York Times, Erdogan argued that Turkey was the only country “with the power and commitment to perform that task”. According to a report two weeks ago, Trump made his abrupt decision to withdraw from Syria following a conversation with Erdogan. A senior administration official who received a detailed readout of the phone call between Trump and Erdogan told the network that Erdogan was explaining all the problems with the US presence in Iraq and Syria and was irritating Trump. According to the source, Trump said, "OK, it's all yours. We are done." Trump argues that Turkey can fill the void left in Syria by America’s departure. “President Erdogan of Turkey has very strongly informed me that he will eradicate whatever is left of ISIS in Syria....and he is a man who can do it plus, Turkey is right ‘next door.’ Our troops are coming home!” he tweeted last week.